БДЖ – BDZ freight train passing Ulitsa 3 level crossing at Obelya, Sofia. 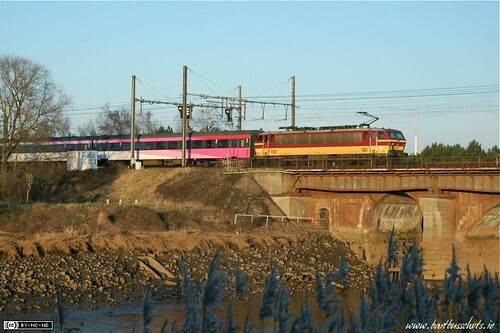 NMBS/SNCB Class 27 electric locomotive number 2705 pushes a rake of M6 double-decker coaches across the river Nete in Duffel, Belgium on it’s way from Brussels to Antwerp with an express service. The bridge across the Nete carries both Lines 25 and 27, both of which run from Brussels to Antwerp, but take different routes for parts of their journey. 8300 class Dart EMU number 8304 passes northbound through the level crossing at Serpentine Avenue in Dublin, Ireland. 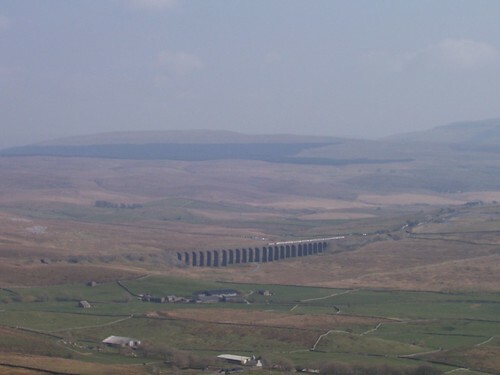 Every now and then, a train would take its passengers over the Ribblehead Viaduct. Some looking customers on a Virgin Pendelino would have been getting an unexpected but very pleasant detour this afternoon. Pendolinos are of course electric trains – you can just make out the diesel engine at the front which is hauling it along the unelectrified train line.